Baltimore Ravens quarterback Lamar Jackson flips it to wide receiver Chris Moore for tricky touchdown. Published: Aug. 20, 2018 at 10:05 p.m.
Baltimore Ravens quarterback Lamar Jackson fires TD to wide receiver Chris Moore on rollout. 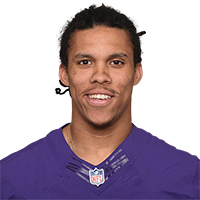 Published: Dec. 31, 2017 at 06:32 p.m.
Baltimore Ravens wide receiver Chris Moore takes off for a huge gain on the kick return into the red zone. Published: Dec. 31, 2017 at 06:26 p.m.
Baltimore Ravens QB Joe Flacco hits wide receiver Chris Moore for a 2-yard TD pass.